After completing two tedious, long and boring months, Manchester United are finally back on the pitch in the decorated pre-season tournament Champions Cup with wins against Club America, San Jose and treble winners FC Barcelona, most importantly by fielding the entire squad through the 90 minutes. The league campaign is set to begin next week and let us take a look on how the season is expected to unfold. The only exciting thing during the two month break is the transfer window. And undoubtedly we had the best one of all and club chairman Ed Woodward deserves a lot of credit for not only avoiding anything similar to the Summer of ’13 but for also doing what other clubs can only dream of. New signings Morgan Schneiderlin, Bastian Schweinsteiger and Matteo Darmian being unveiled at a press conference in Seattle, USA. Memphis Depay (£25m): The earliest signing and the most expected arrival of the four new reds. At just 21, Memphis is the Eredivisie golden boot winner last season with 22 goals and 6 assists in the league to his name and his relationship with LvG made sure we wrapped him up quick. The pacey Dutch winger’s tricky running makes him a man to fear for defenders and can also play upfront in a two man attack formation. Matteo Darmian (£12.7m) : Trained by Nesta and Maldini, Darmian was claimed as the future of Italy defence and now he has already started a number of games for the national team at the right back position. The 25 year old is versatile and is equally effective on the other side of the pitch. His disciplinary record is very pleasing too as he has only 10 yellow cards to his name in 5 seasons at Serie A. With Valencia playing out of position and Rafael expected to leave, van Gaal has turned into Matteo Darmian. Bastian Schweinsteiger (£15m) : The entire United support were in seventh heaven when Bayern Munich announced club legend Bastian Schweinsteiger will join Manchester United. No football fan would need a intro on this man, a footballing legend. The World Cup winner will also be the first ever German International to make a first team appearance for Manchester United. His arrival adds to the squad depth and is a great boost to our midfield. And what a sight it is to witness him in an United kit. Morgan Schneiderlin (£20m) : Targeted by Arsenal and Spurs, successfully captured by United. The central midfielder was the motor behind Southampton’s back to back successful seasons. 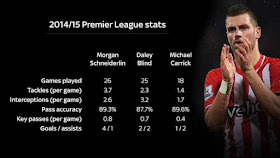 With Michael Carrick in his 30’s, looks like Schneiderlin is the best signing made in this window. The Frenchman who is a box to box defending midfielder would not only gradually replace Carrick but also provide an additional attacking strength to the team. Sergio Romero (FREE) : The Argentine No.1 who played a crucial role in the World Cup for the runners up has now signed for United as a replacement for David de Gea..or Victor Valdes, only time will tell the answer as 5 goalkeepers are set to fight for 1 spot. “It’s not a challenge from my perspective. 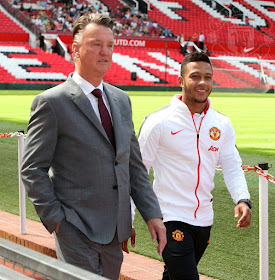 The biggest challenge is blending them into a team that works.” – Ed Woodward on new signings. 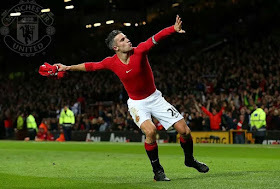 The departure of Premier League winner Robin van Persie (£4.7m) is still hard to take for one half of the United support but sadly age was not on his side and the manager’s decision is final. And the rest of the bid adieu list was unsurprising – Luis Nani (£4.5m) was not on United’s plans anymore and it was the right time to leave, The Portuguese winger did have his share of good days and leaves with plenty of medals. Tom Cleverley (Free) – Not good enough for us and had to leave in order to rescue his career. And we shouldn’t be surprised if Rafael Da Silva and Victor Valdes joins the list soon. Wow! Unbelievable! Exicted! This is how the red army around the world sounded when Angel Di Maria (£45m) signed for a British record fee last season. Roll on a year..and now we are devastated and disappointed the way he wants to run away after losing his position to Ashley Young, no more words on him. Also, we shouldn’t be surprised if Rafael Da Silva and Victor Valdes joins the list soon. The squad depth is highly pleasing but there are a few questions to be asked. Who will play and who will sit out? Which formation will it be? Will it be the same 4-4-2 of the pre-season? The squad depth looks very good considering United will need to play around 50+ games this season. Goalkeeper/Defence : David de Gea at goal hoping he would stay and new signing Sergio Romero as the second goalie and a patientpatient Lindegaard as a backup to the first two, Argentine Marcos Rojo with one of the league’s best centre back last season Chris Smalling and the full back selection above shouldn’t be much of a surprise considering Shaw is injury free. Midfield : The plethora of talent in midfield would even make a manager of van Gaal’s caliber scratch his head on whom to play, it all depends on how well the team settles in. Carrick/Schneiderlin sitting back comfortably with another two central midfielders upfront of the DM. The selection of midfielders will vary as per form, opponents, squad rotation and thereby making it unpredictable but it is very unlikely both Carrick and Schweinsteiger will start in the same lineup, considering the age and speed of both the players. And above all, Daley Blind wouldn’t be sitting and watching the midfield battle from the bench, he too will have a part to play in the centre. Attack : The attacking strength is pretty satisfying too, the selection on the wing will depend on whether Young can retain his form or can PSG bound Angel Di Maria rejuvenate himself at the club or maybe Mata will be tough to drop just like last season despite playing out of position, the first half of the season will surely give our best XI. The forward position will be none other than captain Wayne Rooney who needs to fire up his goal scoring abilities or will end up losing his position as Wilson and Hernandez will be eager to make a mark. There are at least two quality players in every position and we got to wait and watch as it is only a matter of who grabs his chance with both hands. What if Juan Mata is made to play in his favourite behind the striker role? Here is the solution to that problem which will make our starting XI stronger considering Di Maria would stay and Juan Mata would be in the same form as of last season. One of our central midfielders will need to be sacrificed from the previous lineup. Mata playing in his preferred attacking mid position means it will bring back United’s traditional 4-4-1-1. 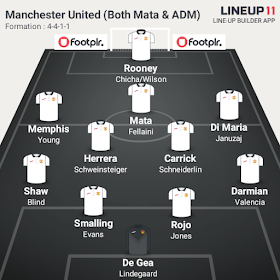 The previous lineup with only change being Mata/Di Maria coming in place of a central midfielder. 1. Memphis Depay : If Manchester United are going to win the title, Memphis has to deliver and make himself worth every penny. The left winger needs to emulate what Eden Hazard has been doing for Chelsea for the past three seasons by adding his name to the score sheet consistently and also make an impact game after game. Memphis has been the earliest of the signings and had a lot of time to engage with his new team mates. 2. Ander Herrera : Made a big money move and immediately became a fan favorite by settling in very quick, the little Spaniard will be key to United’s title hopes this season. The 25 year old was very impressive last season and also added crucial goals. Herrera will need to pair up with another central player from United’s midfield warehouse and create a lethal partnership in order to finish the season on a high. 3. Morgan Schneiderlin : The big transfer saga finally ended when this man arrived at Carrington for medical just behind Schweinsteiger. His transfer move may have been overshadowed by that of his German counterpart but Schneiderlin is expected to play the most crucial part of all the signings. Having a mentor in Carrick alongside him in the squad, Morgan could be the engine United fans would love to have and if he successfully delivers, Morgan Schneiderlin will be proclaimed as Premier League’s most effective season. Although a possible Di Maria departure will leave a big hole in the squad depth and a lack of established cover for Wayne Rooney in the team is alarming, the current Manchester United squad could compete with the champions Chelsea and is better than that of Manchester City and Arsenal. But can they deliver? All in the hands of Louis van Gaal who has pretty much settled at the club and needs to get the best out of his players, failing to deliver next season will put his job under scrutiny. 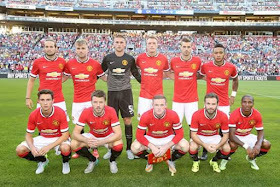 Manchester United’s starting XI against Club America in Seattle. USA. Considering the objectives for next season, a top four finish is not going to be the ambition as it is mandatory for a club of United’s stature, the league will be the main target but the club could end the season on a high without securing the league but by lifting the prestigious FA cup. No matter which trophy it is, Manchester United must lift a silverware to quench the thirst of the fans and thereby also avoiding a mini trophy drought. The current squad looks the most promising since Sir Alex Ferguson’s 2008 Champions League winning team with a blend of youth, courage and grit to get their names written in the history of the biggest club in the world, let us hope performance is delivered.